My mouth was watering with anticipation! My cable company had just promised me one gigabit per second (gbps) Internet service without increasing my rates! It was too good to be true! And, for many of us with older computers, it could easily become a nightmare. The service techs came and went – – – several times (shaking their heads in disbelief). My one gbps service connected to a network card via an Ethernet cable was delivering a whopping 300 megabits per second (mbps). Now, get ready for the stuff they don’t tell you over the phone. The first “requirement” is that you have a “newer” (say, fourth generation or better) computer with a processor that provides a minimum of one gigabyte processing speed. No problem you say? Read on. Older network cards – – – although designated as one gigabit cards – – – can’t handle the higher speed. Simple, you say? Just swap out the card, you say? Most of us dumped tower cases, where you could swap out cards, etc., for the newer, sleeker all-in-one computers or laptops where – – – sigh – – – the network cards are soldered to the motherboard. And don’t even think of using an USB network adapter. Even when connecting them to a “high-speed” USB port, your Internet speed may only hit 450 mbps. It was time to bite the bullet and replace my old fourth generation machine with a brand new eighth generation computer that would blow all my troubles away. Now we come to the last, and hopefully final, stumbling block. Most computer retailers are only selling eighth generation laptops or super expensive gaming rigs. Where were the desktops for us “normal folks”? The answer greeted me as I was slowly shuffling through the aisles at the neighborhood big box store, following closely behind a woman claiming to be my wife, throwing items into the shopping cart I was rolling behind her. I grabbed the box, shoved aside a salesman that was prepared to sell me a service contract I didn’t want, and headed for the cash register. It was mine! All mine! Think that was the end of the story? Read on. I set up the new rig, casting the old computer aside as you would a distant relative. Attached all the cables and voila – – – an Internet speed of 450 mbps. Even the new super-speed computers come with OLD network drivers. A quick upgrade of the drivers and, believe it or not, the computer’s BIOS and we finally made it! 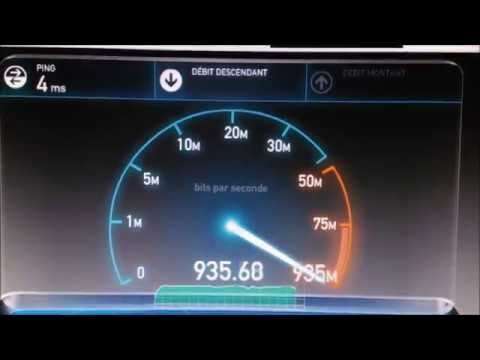 Internet speed was now being clocked at 940 gbps! The moral to this story is quite simple: When a sales rep promises you the sky, ask questions before you realize the sky is falling. Attention Facebook users: Check out Michael Berman’s Jocgeek fan page or follow him on Twitter @jocgeek. You can also contact him via or through his website.